As a business improvement area (BIA), our mandate is to ensure the Financial District is well-maintained, integrated, connected and accessible. Since 2013, we’ve had a detailed master plan that identifies the best strategies to make sure each street provides an improved aesthetic and functional experience over time. BEFORE: Richmond street looking west prior to construction. Our improvements are tied in closely with infrastructure investments and improvements being made by the city in our area. By tying our own improvements to work already being completed, the city and our BIA not only save money but also save the time of people using our area by ensuring the minimum amount of time is spent on constructioin. We act as centralized urban planner for our area to ensure work by different city departments, our area buildings and our own BIA are coordinated as closely as possible. We can’t be blocking pedestrians on a street one year and then again in two years because we didn’t do all the work at once. Richmond Street work being completed this year continuing in 2017 is a prime example of not only our BIA, but our surrounding downtown BIAs working together to provide the best possible street experience through downtown. We worked with the City of Toronto to maximize our investments along with their scheduled water main and TTC track replacements. We also tied our own master plans together with the strategies developed by the Downtown Yonge and St. Lawrence Market BIAs. Together with these other downtown BIAs and the city, you’ll see significant improvements along Richmond Street between York and Church Streets. 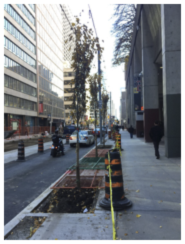 Richmond Street will have 24 new trees including protective tree guards and permeable tree grates for increased storm-water management. Cycle tracks will be upgraded with installation of landscaped planters that not only improve the look of the street but create a safer environment for cyclists heading through the area. Richmond Street looking west during construction showing new tree grates and improved pavement conditions. Richmond Street work will also include repairing the damaged sidewalks, removal of raised concrete planters and installation of tactile walking surface indicators and decorative pavers. Poles through the area will also be wrapped in a poster-resistant material and branded banners will identify the BIA neighbourhoods. 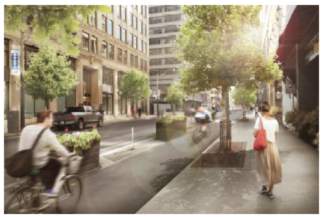 PROJECT RENDERING: Richmond Street through the Financial District will include planters protecting cycle tracks and improved tree grates and pavement conditions. These improvements are beyond city standards and would not have taken place without the involvement of the downtown BIAs such as ours. 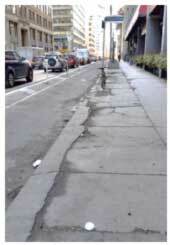 Most of this work will utilize a 50/50 cost-sharing program available to the BIAs through the City of Toronto. This program allows for the city to cover half the cost of BIA improvements as long as they’re tied to scheduled city maintenance and construction. This provides a better overall street environment for the city, the BIAs and users of the streetscape due to the work being completed all at once. While BIAs have clearly defined assessment boundaries, the public doesn’t always see these borders translated to the public realm. This project recognizes this and implements a consistent public experience the will serve to unify the three neighbourhoods while still allowing for opportunities for distinct branding. It is the goal that as future capital improvements are scheduled to the east and west that these standards will be rolled out further into adjacent neighbourhoods. These types of collaborations are still unique amongst BIA capital cost share projects, and this project has laid a strong foundation future cross-boundary improvements. For more information about Richmond Street improvements as they develop, follow #GreenRichmond and @MyTOFD online. 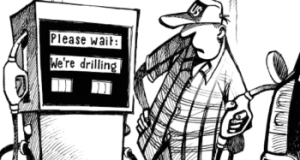 Previous: Why do Liberals tolerate influence peddling?